I’ve been playing nurse for the past few days, doing my best to help Eric beat his flu (and not catch it myself!). 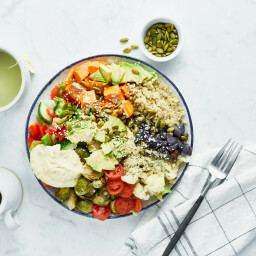 We’ve been eating lots of healthy dinner leftovers like Spicy Rainbow Rice & Bean Salad, Ultimate Vegan Lentil Walnut Loaf, Creamy Tomato Barley Risotto, and Back on Track Wheat Berry and Bean Salad, sure to give any cold a run for its money. 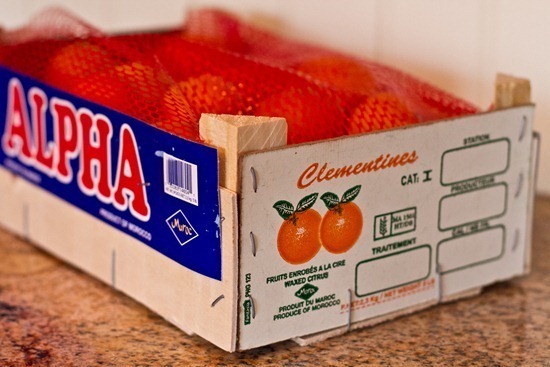 Ah Clementine’s, the perfect winter fruit to ward off a cold, don’t you think? Eric and I have been eating these juicy little delights non-stop, but when he started to feel like he was getting a fever, all he wanted was something COLD to soothe his throat and help his body cool down. I started thinking about packing vitamin C into a delicious smoothie and then it hit me – Why not make a smoothie based off of one of our favourite childhood popsicles- the Creamsicle? Yes, this just may work. Directions: Peel and freeze the avocado, Clementines, and banana before making this smoothie. 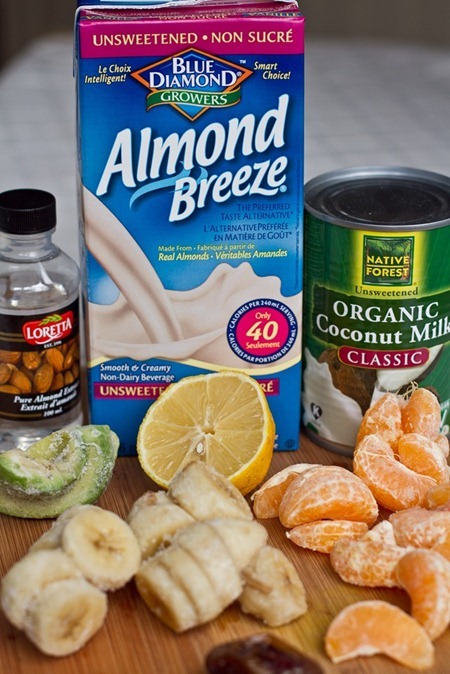 Once frozen, place all ingredients into a blender and blend until smooth. You may add more liquid if it is too thick. Makes 2 cups. Once those are frozen (they must be frozen before making or it won’t work) grab your chilled coconut milk, almond milk, almond extract, lemon, 1 medjool date, and your frozen avocado, banana, and Clementines. Place into a blender and blend until smooth. If it is too thick, add a bit more almond milk to thin it out to your desired consistency. It should be very thick and almost like an ice cream shake though. The result is a creamy and energizing smoothie, with a hint of orange that will help keep those cold bugs at bay! Eric is pretty much obsessed with this smoothie and he asks for one about 6 times a day. Oh, and it would also be delicious with any type of Winter citrus I’m sure. Here is to a healthy 2011. That looks delicious! I think I might have to whip one up. Is it okay to share on Raw Food Rehab’s community site if I attribute? I know lots of people would love it. O.M.G. This looks incredible. I can’t WAIT to make this! Just another amazing recipe to add to your cookbook! Urgh, I hate being sick and have a cold right now so I feel for Eric! You are good at playing nurse though and that smoothie looks amazing. YUM-O!! This is just what we need right now!! Great idea. Hope you stay healthy and that Eric is back to feeling better soon. YUM! I loooove clementines. 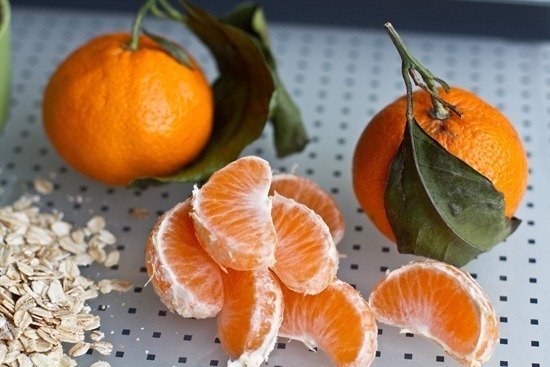 I really want to try candying clementine peels. Hope Eric feels better! Thanks Emma…Happy New Year to you too! Make a cook book! PLEASE! I seriously make something from your recipe page every day. Love this!! 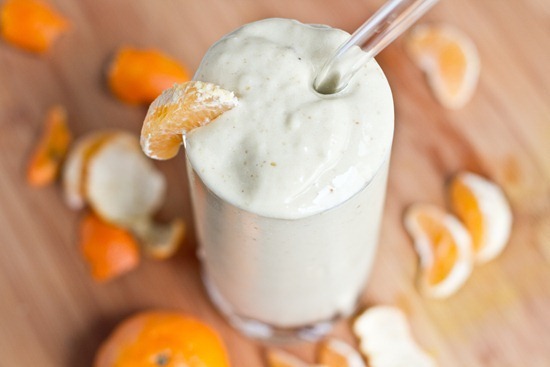 My dad used to make us creamsicle milkshakes when we were little – definitely making this! I used to loooove orange creamsicle popsicles. I’m not feeling so hot myself AND I have all of these ingredients. Will definitely be made today! Oh my gosh that looks good! I love clementines (we buy them whenever we seem them at the store), and I love anything orange-cream flavored. I almost wish I had the flu just so that I would have an excuse to make your smoothie ;) . Oh my goodness this sounds incredible! I hope it works in a non-Vitamix blender. I know this is a winter smoothie to ward off the flu, but my oh my these photos are bringing summer to mind… and I like it! creamsicles are so good, if it tasted exactly like that i would be hooked! YUUUM!! I am making oe of these today! Yum! And without that weird flourescent colour! Hi Angela! I just wanted to say how much I adore your blog. Your recipes are incredible and so helpful for someone like me who doesn’t have much imagination in the kitchen. I”m actually committing to a 30 day vegan challenge this month because I want to see how the changes in my diet really do affect my skin/acne and mood/energy levels. Your blog is definitely going to be my cook book bible haha! This looks amazing…but how do you bring yourself to drink a smoothie when it’s so cold outside? Yesterday it was 8 deg F and I wanted to stay in a blanket all day! Eric had a fever so all he wanted was something cold! nurse Angela with the best remedy! come to the hospital and serve my patients that, I’m pretty positive they would prefer it 38457398753x better than hosp food, and I have no doubt that they would heal quicker with all those vitamins! Yum! Mmm, if I took to the time to peel all those clementines, 90% would be popped directly into my mouth. 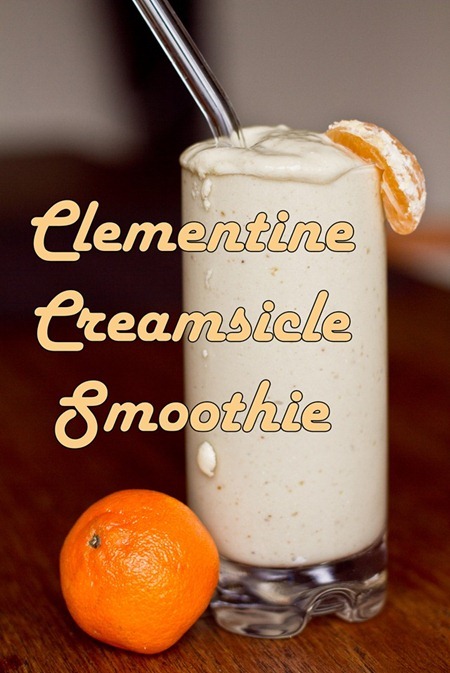 Not sure if I’d ever actually get any in the blender :) Creamsicle is should a good smoothie idea! Oh my word, in the words of the Fitnessista this looks “Foodgasmic”. You can not go wrong with creamsicle for brekkies. you had me at the word creamsicle. i’m such a sucker for creamsicles! hope eric is feeling better! I think I can eat about 47 clementines in one sitting =] Love the idea for a creamsicle smoothie! You…Are…Amazing! Anything that is called “creamsicle” is a winner in my book! I dont know if they have those thing in canada that are called “orange pushups”. They are like a creamy sorbet ice cream of sorts and you push them up thru a paper tube. Think kiddie ice cream treat. Well if you have ever had one, your smoothie reminds me of the grown up and far more healthy and delish option…and I am so making this! Hope Eric is too. And that he’s on the mend, soon! haha i used to eat those too!!!! This looks 53988583 x better than a creamsicle, I want to go and make one right now, but it’s just a little too cold for me to enjoy one. Yum!! This looks divine! I miss creamsicles! wow! I love clementines, and am desperately in need of a flu buster! thanks! Oh my! I love clementines and creamsicles!! This looks amazing!!! Happy New Year! That looks amazing! I used to love creamsicles. Angela, I don’t think I’ve left you a comment before, but I wanted to say I absolutely love your blog! You are an inspiration to me, and your recipes are to die for. Keep up the great work!! Mmmmmmm sounds tasty! I’ll have to buy the ingredients the next time I go to the store! I LOVE LOVE LOVE creamsicle anything. I’ve made orange dreamsicle cookies too. I think instead I’ll put a new twist to it. I totally forgot how much I love creamsicles until you posted this! Can’t wait to try it! Oh my! I wish I would get things like this when I was sick! I love my husband dearly but… his idea of a flu-buster would be a burger or something just as absurd. That sounds amazing! And looks JUST like a milkshake! Mmmm that smoothie looks perfectly cool, creamy, and delicious! Your recipes and commitment to making whole, healthy foods are really an inspiration! All the best in 2011. Sounds really yummy. 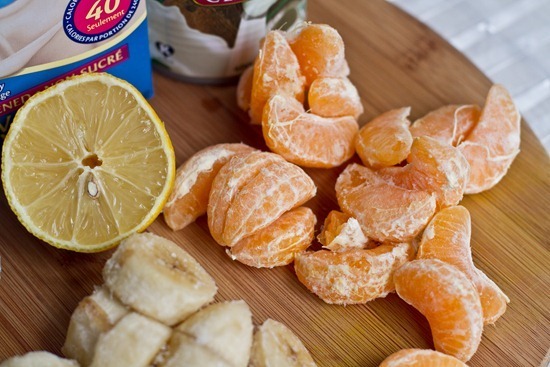 I never think to freeze oranges or clementines. The almond extract seems a little out of place but I will trust you! I find it is very subtle in this amount (1/4 tsp) but it makes the orange flavour pop a bit more! Just don’t put too much almond extract because it can be overwhelming. Oh my gosh, I would eat that even without sickness! Yum! Freezing clementines…what a great idea! This looks divine. You are so creative Angela! this looks amazing, and so healthy! Love your pictures… Your Smoothies looks amazing. Ashlee, my wife makes Green Monster smoothies all the time (http://ashandlewplus2.com/2010/09/04/green-monsters-and-greek-yogurt/) and I really love it.. I am looking forward to trying this one. I am making that this weekend! I love smoothies. I’ve even started taking Green Monsters to work for lunch. Take care of Eric. I hope you stay flu free. Oh man, I MUST have this! This looks super good. I want to make it tomorrow but I have no coconut milk. Is there anything I can substitute it for? I’m also wondering what is the date do for the smoothie. I’m curious! I’m sorry to hear Eric’s not feeling well. I’m sure you’ll nurse him right back to health. This smoothie sounds absolutely amazing! It looks so decadent and creamy, especially with the addition of avocado! We have a nice big box of clementines sitting in the kitchen and I think I have a good idea as to what is going to happen to them now! This smoothie sounds BRILLIANT. I have been eating a ridiculous number of clementines lately. LOVE. I also feel like I have a cold coming on… scratchy throat and all. This smoothie may need to make an appearance tomorrow to pump up my immune system and soothe my throat! I couldn’t find any decent bananas or avocados at the co-op, so I replaced them with frozen peaches and mango. DELICIOUS. Especially if topped with some ground nutmeg….it really brings out the flavors! That looks sooo good. I used to love creamsicles. 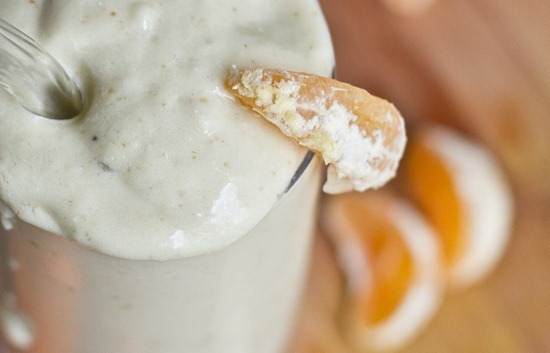 Only you could make something as decadent as a creamsicle into a healthy (vegan!) treat sure to bust a flu. Your creativity never ceases to amaze me. I especially love that you used clementines; I’ve been going crazy for them, too! I hope Eric feels better soon. For extra vitamin C, try giving him cauliflower&&broccoli. Cauliflower (& I think broccoli, too) has more vitamin C than an orange. Cool, huh? MMMM clementines are the best!! That look soooo perfect for the summer! I really hope it cured eric! 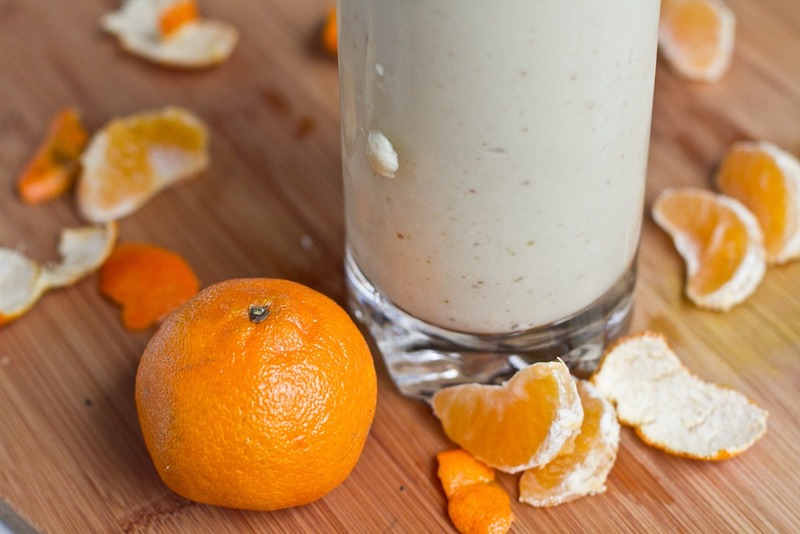 I spent the last few weeks blending bucco clementines into smoothies the past few weeks, but never thought about freezing them (along with avocados) first. Clever! Thanks again for a fantastic recipe. On an unrelated note, do you use a heart-rate monitor? Is anyone aware of an accurate, but not super expensive one? I have a HRM with my Garmin 305, but I dont use it. I think it works quite well if I remember correctly though. 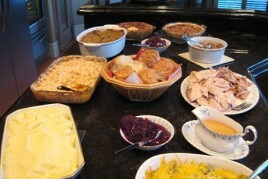 Thanks for posting another great recipe! I don’t comment much on your blog, but I read every post. I wanted to take an opportunity to let you know how much I appreciate what you do. Your posts are always so thoughtful, beautiful (great photos! ), and fun to read. And your recipes are amazing. I’m really looking forward to what you have in store for your readers in 2011! This smoothie looks so yummy. You really do know how to take care of your man.. Eric is a lucky guy. Hope he feels better soon and here’s to hoping you don’t catch the bug. Lucky Eric!!! (well, for the smoothie, not for the flu) Hope it did the trick and he feels better soon. What an absolutely genius smoothie! I REALLY want to try this out! What an amazing recipe. I just made this for my boys for their back to school breakfast and they both loved it. 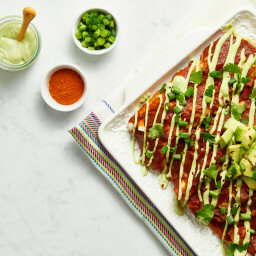 I didn’t have the avacodo so I left that out and added a bit of vanilla protein powder for them but it still tasted great. Thanks for the recipe! i just love all your smoothies. They look so thick and decadant. This looks delish!!! Can you taste the banana? 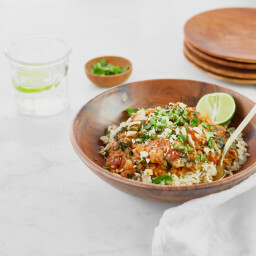 I have everything to make this at home except the coconut milk – do you think it would be okay if I omit? 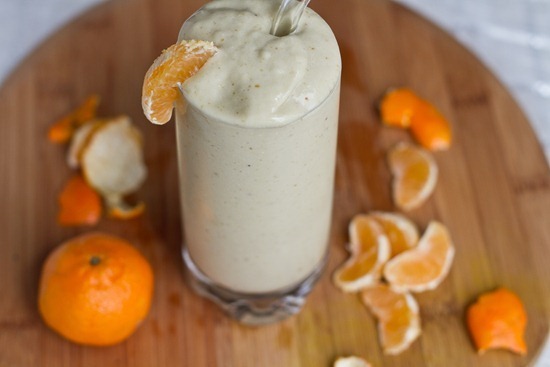 This looks wonderful, I haven’t had a citrus smoothie in a long time. Poor Eric, I hope he’s feeling better soon! Finally got around to making this wonderful drink this morning. Fabulous! Fantastic! So thick & creamy. My poorly made blender finally bit the dust two days ago. I saw these yesterday and was so determined to make them that I went out just to buy a new blender. I was a little apprehensive about using non-dairy milk (you adopt a dairy-friendly attitude when living in Wisconsin), but I’m so glad that I picked a carton of almond milk! These are great! I had them for a treat last night and used my leftovers for breakfast this morning. Thank you! I see the Almond Breeze milk on your picture. Have you tried the new President Choice Organic (unsweetened) almond milk? I have never been a fan of almond milk because of the flavourings, but this one is super yummy. Waiting to finish my stash of oat milk (for me) and Brown rice milk (my daughter’s) and we’ll switch to the PC almond one. Tried it in the green monsters, yummy !! aw so funny that you mentioned the PC organic! JUST picked some up (saw it was the same price as Almond Breeze regular!) and I tried it today….in love. I will have to blog about this for sure. hah that’s awesome! Im glad im not the only one spending too much time in there….well, I hope it’s worth it for you and you enjoy them! I always spend a lot of time in the kitchen. It’s in the blood. My brother is a chef (and teacher), our parents owned a hotel restaurant in France (on an island on the western coast), and for me food has to be home made and super tasty and healthy. And I want my kids to grow like this too… they have to know what “real” food taste like! I made this smoothie for dh today, since he’s fighting a cold. I had some extra, so I had a little and gave the rest to my four kids. It was awesomely delicious! My youngest boy finished his off and then spent the next few minutes tipping the cup at many different angles to get every possible drop…:D. It was definitely a hit at our house, and I never knew an avocado would taste so good in a smooothie! Sounds delicious, however banana and Clementine do not mix together, a sweet fruit and acid fruit counteract each other and can cause more damage than good. Maybe make it without the banana and dates? Angela, I’ve been making this smoothly at least 3 times a week! It is delicious!! I don’t usually have coconut cream so I leave that out and reduce the cashew milk to 3/4cup or less to make it extra thick and creamy. Thank you so much!! I’m sorry, but I’m really confused. Are you supposed to freeze the flesh of the acovado, or discard it? How are you supposed to get the cream from the top of the coconut milk? Is the watery part of the coconut milk the rest of the can contents minus the cream? If I want to use another kind of milk instead would I still need to use another 1/2 cup + 2 tbsp? Does the almond milk, almond extract, lemon, and date also have to be chilled? I’m pretty new to smoothies and eating healthy in general, so a lot of this stuff is really unfamiliar to me. Is that a lemon I see in the picture of the preparation for freezing the fruits? I didn’t see lemon anywhere in the directions so I’m just wondering how to incorporate it…? Nvm sorry I see that you use it for its juice. It was just confusing bc the directions are for preparing to freeze avocado, clementines &banana but the picture is of a lemon instead of an avocado so I didn’t understand. This looks fantastic! I’ve been loving cutie’s clementines, just made jumbo muffins from the Secret Life of Walter Mitty movie’s clementine cake recipe, and used the rest to create a Cuties Vinaigrette (saltsugarsea.com/orange-vinaigrette), but clearly I need to make a trip to store for more as I’m currently nursing my baby with tissue stuffed in both nostrils :(. I’m trying it today for sure! YUMMM!! I just searched your site for “flu” and stumbled across this, since I’ve been battling a nasty cold for the past two days- I knew you would have something that would help me! It was just what I needed to get some vitamin C in my belly and soothe my sore throat. I didn’t have coconut milk so I just used a mix of homemade almond milk and coconut water. I also added in some mangos. So good! I’m glad this smoothie helped, Laura – get well soon! Looks great. Kids would definitely love this. I referenced this recipe in my immune boosting smoothie list if that is OK with you. Love love LOVE THIS!! Its my go to!! Once people Start getting sick at work I drink this to keep from catching their bugs 😁 so yummy!! This was delicious, everybody in the family wanted a glass and it was gone quickly! I used japanese mikan or mandarin and it worked very well. I’m so happy you all loved it Sophia! Just made this and it was AMAZING. Thank you!!!! !